The teacher edition for the Truth, Reasoning, Certainty, & Proof book will be ready soon. 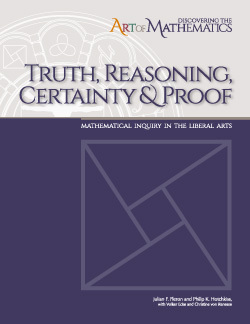 The learning guide “Discovering the Art of Mathematics: Truth, Reasoning, Certainty and Proof ” lets you, the explorer, investigate the great distinction between mathematics and all other areas of study - the existence of rigorous proof. Exploring paradoxes, optical illusions, psychological illusions and historical paradigm shifts challenges your perception of certainty. Moving more carefully brings you to consider burdens of proof and different types of reasoning. You build your own proofs, unlocking the secrets behind number theoretic patterns, mathematical magic tricks, geometric theorems, and even into the imaginary numbers - where circles kiss and mystery of signed multiplication is uncovered. You push the envelope of certainty into the 20th century where determinism, chaos and fractals, relativity, and uncertainty bring new questions as to the limits of knowledge. Exploring the Island of Knights and Knaves leads you to Gödel’s landmark incompleteness theorems - fundamental limits to knowledge.